The primary difference in Strip method and FUE techniques is the Mode or Method of Extraction of the grafts. Rest of the procedure of Implantation remains the same in both the methods. 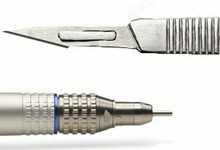 Regardless of which donor harvesting technique is employed, proper extraction of the hair follicle is paramount to ensure the viability of the transplanted hair and avoid transection, ie the cutting of the hair shaft from the hair follicle. Hair follicles grow at a slight angle to the skin’s surface, which means that regardless of technique used the transplant tissue must be removed with a corresponding angle and not perpendicular to the surface. We then use very small micro blades or fine needles to puncture the sites for receiving the grafts, placing them in a predetermined density and pattern, and angling the wounds in a consistent fashion to promote a realistic hair pattern. Depending on the extent of the procedure, the transplant will take approximately four to eight hours. Additional sessions may be needed if you continue to lose hair or decide you want thicker hair. The advantage of FUE over strip harvesting is that FUE harvesting negates the need for large areas of scalp tissue to be harvested, so there is no linear incision on the back of the head and it doesn’t leave a linear scar. 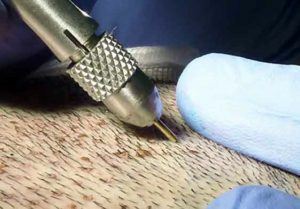 Because individual follicles are removed, only small, punctate scars remain which are virtually not visible and any post-surgical pain and discomfort is minimized. 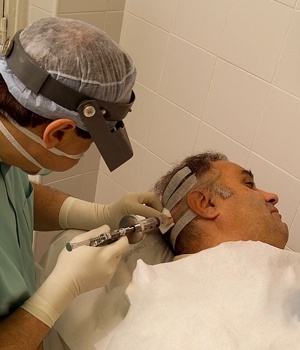 As no suture removal is required, recovery from Micro Grafting FUE is less than 7 days. Disadvantages include increased surgical times and higher cost to the patient. 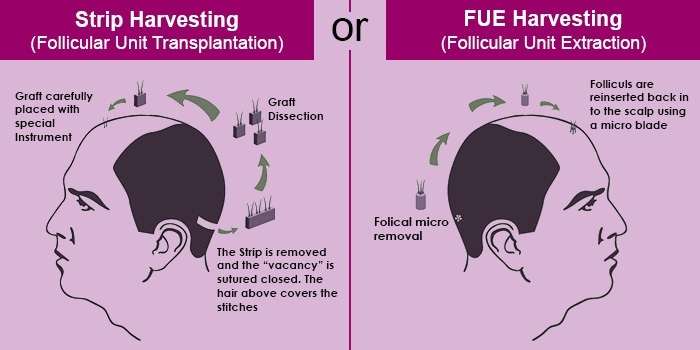 We have noted that FUE can lead to a lower ratio of successfully transplanted follicles as compared to strip harvesting. Others also suggest that in case a patient would need more than one transplant, it would be difficult to find a good strip after an FUE. As in FUE method we don’t close or reduce the size of the wound. It leaves a larger area to heal giving to a larger area of scarring. When your hairs begin to thin, the scars over the safe zone and thousands of scars will start to become even more noticeable.